Parent and teacher expectations dramatically affect children's achievement; however, society gives parents and teachers mixed messages about how much to expect from their kids. Sometimes they're told to expect more; sometimes they're told they're expecting too much and are pressuring their children. Children's personal expectations of themselves typically reflect either adult expectations or rebellion against those expectations. When parents and teachers don't expect enough, children rarely complain. However, they underperform and lose confidence in their abilities to achieve. They show symptoms of anger, anxiety, and depression. The new Federal Title I program is spearheading an attempt to raise expectations for disadvantaged students by accelerating and enriching curriculum. Much of what educators have learned about acceleration and enrollment from gifted education will be applied to educating children of all abilities. Although differing abilities and learning styles in children cannot be ignored, children may achieve more and fulfill adults' expectations if more is expected of them. High standards can be effective motivators. Another lesson from gifted education is that too high expectations can also cause problems for children. Highly competitive goals that feel impossible to achieve can cause children to procrastinate, give up, feel stressed, and show the same symptoms of anger, anxiety, and depress oo much. Of course, that doesn't mean they're unable to achieve those expectations; it only means that they don't believe they can. They feel pressured. Sometimes parents cannot even identify the sources of their children's pressures, even when they are being blamed for them. Always expect children to do more if they are not investing time and effort into their work. If you teach children techniques for becoming efficient workers, you can expect them to achieve more. Raise or lower your expectations "gradually" and state them directly to your children. Give children time for adjustment. Discourage them from expecting too much too soon; change takes time. Be aware that your expectations about siblings and friends will be generalized by children to expectations for themselves. They will assume you have similar expectations for them and will compare themselves to their siblings even when you don't compare them. Definitely do not compare your children to each other. Stay as positive as possible, but don't praise poor work unless it demonstrates improvement. Helpful criticism is better than dishonest praise. Acceleration is motivating. Help children monitor their progress and success on charts. They will gain a sense of personal intellectual power related to their progress. IQ and achievement tests can provide guidelines; however, they should not be viewed as absolute limitations. Children can usually accomplish more than tests predict, provided they are willing to work hard. Parents, if there is more than one, should be united in their expectations for their children. If one expects more and the other less, children who lack confidence will avoid effort and take "the easy way out." 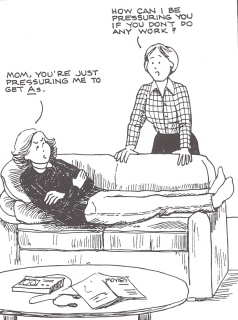 Parents should discuss expectations for their children with their children's teachers. Parents' positive support for teachers makes an important difference for children's achievement. ©2010 by Sylvia B. Rimm. All rights reserved. This publication, or parts thereof, may not be reproduced in any form without writt en permission of the author.